By the early eighties, Foodtown had made some inroads into direct supply of green leafy vegetables, tomatoes, kumara and a number of other crops. Kumara were in fact one of the early crops which were 100% directly supplied – by no other than the late Gary Blundell. When it came to potatoes though, Foodtown had a bit of a problem. One of my predecessors hat come back very enthusiastically from PMA in the US, having been introduced to the concept of washed potatoes. We might takes these for granted these days… but that was not the case 30 years ago! Foodtown, naturally, approached Turners & Growers, its potato supplier, to suggest that potato washing should get onto the company’s agenda. The answer was somewhat surprising…”it could not be done”, said Turners & Growers. The reason given was the soil condition in Pukekohe which would defeat any effort one could undertake to get potato washing under way. Luckily, Foodtown chose not to take NO for an answer and started a conversation with a large potato grower in the area, A. S. Wilcox & Sons and the ingenuity displayed by Lex, Henry and Ross Wilcox sure enough got washed potatoes onto Foodtown shelves within a year. And they have remaind there ever since. Direct from the source from Day 1 and no longer supplied by Turners & Growers. A further chink in the relationship…. Posted: April 30th, 2013 under Supermarket - produce, value-add. The T& G board advised Foodtown that “it was not prepared to agree to its proposal as the board was convinced it would be contrary to the interests of growers, consumers, retailers in general and the company”. (Ibid). On one hand, the traditional produce wholesale company which had by then successfully been in business for half a century. In the opposite corner, a business which had barely started a dozen years earlier and already threatened to disturb the industry fabric. Judged from a given point in time in, say 1970, one can understand the Turners & Growers perspective. The system was working. It was not broken. Therefore no need to fix it. From the supermarket’s point of view though, the system was already beginning to fray at the edges. Getting produce to twelve stores every morning came with its challenges and being able to take possession of that produce the night before would have been a lot easier as the auction process itself was not very efficient. Here is a description from the Auckland Fruiterers Association site. Foodtown therefore quietly continued to build a core group of growers prepared to deliver some produce direct whilst maintaining a daily presence at the auction markets. Posted: April 8th, 2013 under Industry Politics, Produce Companies, Supermarkets- the other stuff. The Turners & Growers Annual Report for 2012 showed up in the mail today. I was tempted to comment straight away but I will wait for a while and let it settle. In the meantime, I shall continue with the missing years in the Turners & Growers timeline. 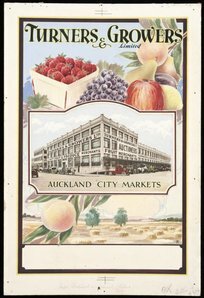 Fruiterers are innovative fellows and in the mid-fifties one of them, a certain Tom Ah Chee whose family fruit & vegie shop was up on Karangahape Road started dreaming – and he dreamt big. So big in fact that when he retired he could look back onto a company that started from the one fruit shop and had spawned 30+ supermarkets in Auckland, Hamilton and Tauranga at the time. The company was Progressive Enterprises Ltd and the supermarkets were called Foodtown. A by-product of that growth was what amounted to a fundamental change to the way the produce business was conducted. Change did not happen overnight…but a head of steam started to build from the early sixties onwards and Turners & Growers were right in the midst of it. In November 1968, the head of steam had becoming sufficient enough to warrant discussion at a special Turners & Growers board meeting. Here is what the then General Manager had to say to the board . “For the past few years, a new class of retail buyer has become prominent in Auckland. I refer to the supermarkets. These have been established for a quarter of a century and undoubtedly have cut across the retail trade in New Zealand as well as in all other coutries where they operate. For some time now a leading supermarket organisation had been pressing us to arrange sales of vegetables delievered directly from the growers.Up to the present time we have been able to avoid getting involved in that type of business…One of the leading supermarkets is now exercising further pressure and has intimated that if they are unable to get supplies direct from growers through our organisation they may be forced to dela directly with growers themselves.” (Stead, K. One Hundred I’m bid. A Centennial History of Turners & Growers, 1997. ISBN 0473 04169 3. Kestrel Publishing). All I can say – opportunity lost. 20+ years later, in May 1989, Foodtown walked. Why that took so long and how the separation was achieved will be discussed in future posts. Posted: April 4th, 2013 under Industry Politics, Produce Companies. So, where are we at in the lead-up to Easter 2013? That’s right… The CEO who was not going anywhere, did indeed go off somewhere in search of a new home a short week later. The talent which had exited Turners & Growers prior to the now exorcised ex-CEO tripping himself up is happily finding new homes across the road at Freshmax and I presume elsewhere. The Noboa shareholding is wondering whether there will be any more Fyffes banana imports anytime soon and the staff left in situ are running a book on when the next restructure will occur. In the meantime it is business as usual at Turners & Growers. Or is it? I guess, that depends on how one defines this phrase…business as usual. [Rykers, Leslie Bertram Archibald], 1897-1976 :Turners & Growers Ltd. If one visits the Timeline on the Turners & Growers website, one quickly discovers that, at least in Turners & Grower country, time appears to have stood still between 1959 and 1993. Nothing happened here, Sir! Nothing to report… Business as usual. Business as usual, my foot. Any observer with the rational thought ability of a seven-year old child is able to deduce that a whole bunch of things occurred between 1959 and 1993…and that Turners & Growers must either have been in a deep slumber a la Snow White after eating her poisoned apple (now here is a thought) or the events of those years must have had such a dramatic impact on the company that the decision was made to simply pretend that those years did not exist! In order to understand the Turners & Growers of today, one needs to start a little earlier though. In 1936 to be precise. That was the year when Michael Joseph Savage, New Zealand’s first Labour Prime Minister won the general election. He radically started to change the country’s economic drivers. One of the consequences was the establish of a government import monopoly for fresh fruit, managed by the Ministry of Internal Affairs.This state monopoly stayed in place until 1949 when the incoming National Government decided to set up a company in cooperation with all the produce merchants in the country, for the purpose of managing the importation of tropical fruit from a commercial perspective. (What does that remind you of by the way… an early version of a State Owned Enterprise by any chance???) The new company was called Fruit Distributors Ltd (FDL) The company still exists by the way. In order to get a feeling for what happened next, a visit to this very informative page on the Auckland Retail Fruiterers Association website would not go amiss. 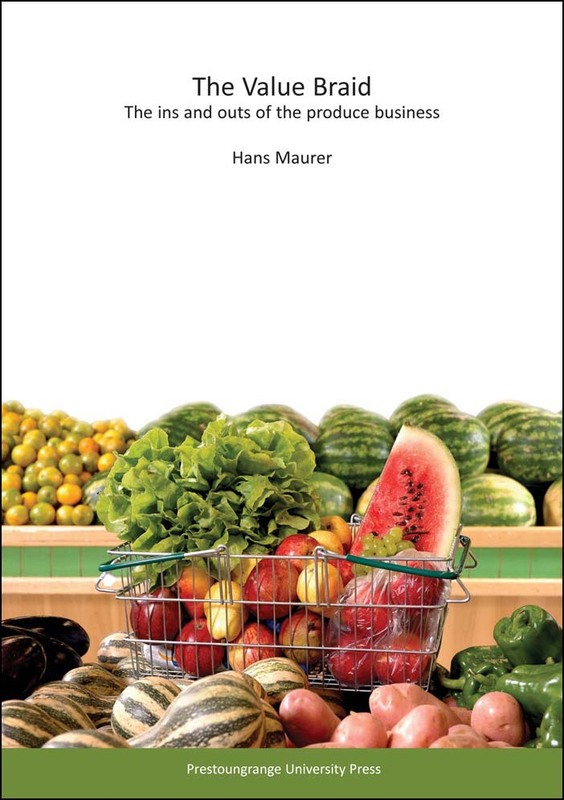 What the Fruiterers site does NOT spell out in detail is that Turners & Growers during the 1950s and 1960s became the majority shareholder in FDL through acquiring the key produce merchant companies across the country, all of which had been allocated a shareholding in Fruit Distributors at the outset. What is not entirely clear today is whether the merchant company acquisitions yielded the shares in FDL by fortuitous happenstance or whether the desire to own FDL drove the competitor buyouts. Posted: March 29th, 2013 under Bananas, Industry Politics, Produce, Thoughtpieces. Who doesn’t remember this Johnny Cash Classic? There has been a bit of hype in the media over the last few days in relation to Turners & Growers CEO Geoff Hipkins. Is he there or is he not? What exactly happened in Berlin? What is the T&G board going to do about it? As an industry commentator I have to say that reputable publications such as fruit net do not run stories for purely speculative reasons. So where there is smoke, there is also going to be fire. The produce industry is a people industry. We don’t always agree with each other and we are often found taking diametrically opposed positions, but at the end of the day, the industry functions because of common courtesy and respect being the fundamental pillars upon which business relationships are built. And when these pillars start to crumble, business suffers. Respect goes beyond today and reaches into the past…Respect for accumulated knowledge, respect for institutional memory, respect for lessons learned from past mistakes, respect for an in-depth understanding on how the produce industry works. It seems that there might be room for improvement in this department if the ENZA Gold growers are to be believed. As a T&G shareholder, I am a little disturbed to see the losses mounting, key staff disappearing, not so well thought through import deals causing disturbance in the market place and I am sure others share these concerns as well. The cryptic message to the New Zealand Stock Exchange on the matter of recent media speculation therefore only adds fuel to the fire. It does not calm the waves. Which brings me back to Johnny Cash. How high will the water need to rise? Posted: March 11th, 2013 under Industry Politics, Observations.